After making a 1/2″ tool holder that holds a tool by using grub screws, I was looking at my Bosch router and thought that its 1/2″ collet would be ideal on the mill. This project is the result. The first trick was to get the collet out of the nut. 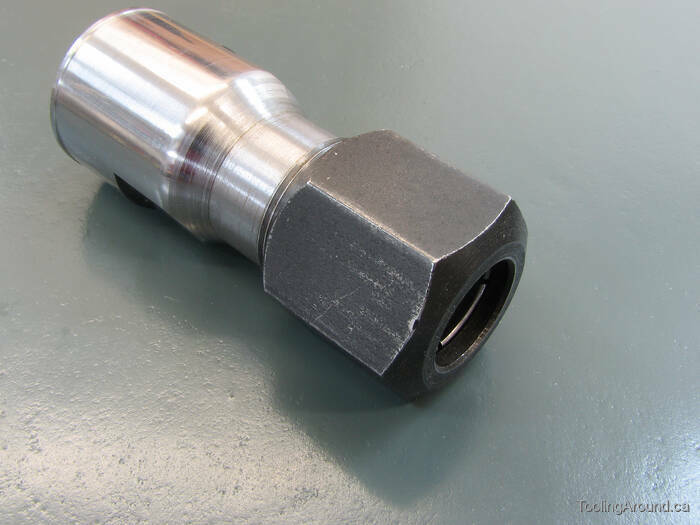 The nut has an internal groove that captures the ridge on the wide end of the collet. The challenge was to compress the collet so the diameter of the ridge would be small enough to clear the groove. I used a coil of fine copper wire, which I forced down over the collet's taper until it compressed. The coil was a winding, salvaged from some discarded device and residing in my junk box. Being copper, it wouldn't scratch the collet, and it was small enough to fit inside the nut. A Taig blank arbor was the starting point. The 3/4-16 thread was bored out in preparation for threading to fit the ER-16 mill spindle. The thread was cut as described on the page about making the Mk I tool holder. The mill headstock was mounted on the lathe and the diameter of the collet end of the tool holder was reduced preparatory to cutting the thread for the collet nut. The tool holder was centred before milling wrench flats. The tool holder sits higher in the chuck jaws because it's threaded on to a test piece. I use the test piece whenever I want to check the fit of a M22x1.5 thread. In this case, it afforded better purchase for the vise jaws. The flats for a 22mm wrench revealed just a little bit of the internal threads. This is harmless. 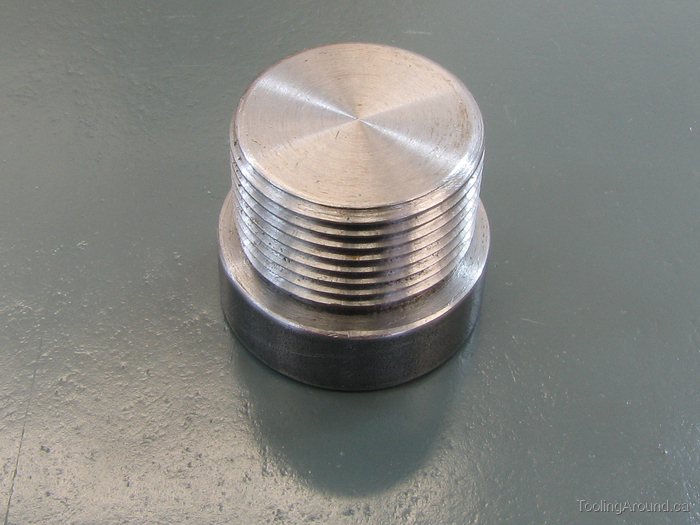 The top slide was set to an angle matching that of the collet taper. The calipers show the length of the taper and the dial indicator shows the amount of offset over that distance. The desired amount was determined by taking one half of the difference in the diameters of the two ends of the collet taper. Next, the taper for the collet was bored. It's important to observe that the taper was cut while the tool holder was mounted on the mill headstock (which, in turn, was mounted on the lathe). This guarantees that the collet will be held exactly on the spindle's axis of rotation. In other words, everything's concentric. I don't have a photo of the external threading operation, but it's simple enough. Here's the completed body. I'm pleased with how well the taper turned out. This is how it looks, holding a Woodruff key cutter (which is also useful for cutting small T-slots). There's nothing wrong with the Mk I version, but I do like this one better. The collet won't mar a cutter's shaft, whereas a grub screw probably will, if the shaft doesn't have a flat.